Experts in action. PHOTO: Woods Institute for the Environment. Connections between climate and security continue to be debated inside and outside of academia. 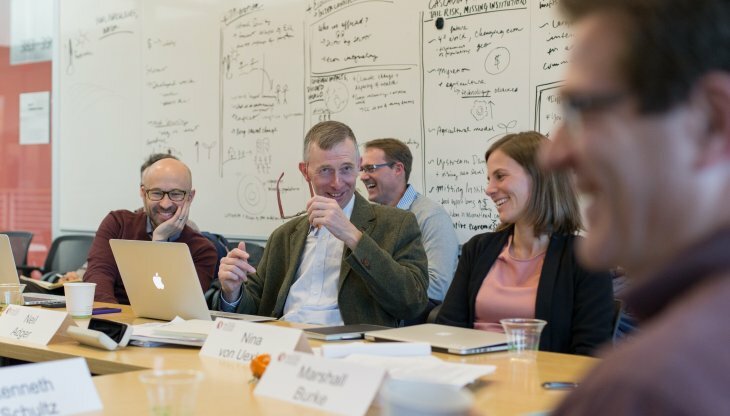 Last week, I attended a workshop at the Woods Institute for the Environment at Stanford University, together with Nina von Uexkull and nine other invited participants representing a variety of academic disciplines and viewpoints, to discuss impacts of climate variability and change on armed conflict. The workshop is part of a larger ongoing expert elicitation project that seeks to identify extent of agreement and origin of disagreement among leading scholars of climate security. The overall aim of the project is not to reach consensus but rather to provide a thorough assessment of the full range of judgements about the state of the art, which will serve as a foundation for offering guidance and advice on future research as well as policy. Most of all, I was struck by the sincere curiosity, honesty, and respect that everybody brought to the table. Over the two days, we discussed both historical and potential future connections between climate and conflict; what might be important indirect causal pathways and scope conditions; which cases (if any) of contemporary conflict might be attributed at least partly to shifting climatic conditions; what are prevailing limitations and emerging opportunities for studying climate change and conflict; and what are the main sources of uncertainty when looking into the future. As a point of departure for these discussions, we were presented with preliminary results from the first stage of the project – in-depth interviews of all participants and a set of stakeholder representatives – completed earlier in the fall. The workshop discussions were entertaining, engaging, and deeply enlightening, but never properly heated. On some issues, the group displayed a high degree of agreement but there were also considerable heterogeneity in certain assessments, especially when participants were asked to quantify the range of plausible climate effects in specific contexts. Most of all, I was struck by the sincere curiosity, honesty, and respect that everybody brought to the table. The third and final component of the elicitation project, currently under development, will be a joint publication that documents the expert assessments in greater detail and concludes on the way forward. The project is competently led by Katharine Mach, Carolien Kraan, and Chris Field at the Woods Institute, who deserve much praise for organizing the event and herding the group safely though a packed workshop agenda. Stay tuned for details on the results from the project. Workshop participants. PHOTO: Woods Institute for the Environment.